As a member of the Braeburn Group of independent Apple analysts, there isn’t a day that goes by I’m not slicing and dicing the latest company news and media speculation about forthcoming products. For our members, Apple analysis is a full-contact, participatory sport. No one has the luxury of just sitting on the sidelines. News reports from Apple component suppliers, Wall Street analyst commentary, patent disclosures, web usage stats and just about any other tidbit of information about Apple generates spirited discussions and debate on a daily basis. It’s what we do and please don’t ask why we do it. For our members, even a brief visit to an Apple retail store is more than a shopping trip. It becomes an adventure in acquiring anecdotal data. It’s observing which products are captivating the attention of shoppers and what devices might be purchased during our brief store visit. There’s no clue we won’t pursue in our data hungry quest for information about all things Apple. As analysts we seek to take both a short-term and long-term view of the company. Because data is both current and historical and projections are based on the extrapolation of data into future periods, there’s a data dependency in developing both short-term and long-term performance models.The more data the better and the more reliable the data the better the projections.This is why current data is the focus of so much discussion and debate. Apple’s fiscal quarters are nothing more than static snapshots of a fast-moving enterprise object. Ninety-one day cycles come and go with a blur. Still, quarterly and yearly results are a standard for gauging a company’s performance. The graph below illustrates Apple’s revenue growth by year since FY2005. The Apple iPhone was released in June of 2007 and the iPad was released in April of 2010. From FY2005 to the end of FY2013, Apple’s revenue rose 1,127%. In dollar terms, revenue rose from $13,931 billion in FY2005 to $170,910 billion in just eight years. The 8-year period encapsulates the migration of the Mac to Intel processors and the release of two new products that currently comprise just over 75% of the company’s reported revenue. The graph below illustrates Apple’s earnings per share growth by year since FY2005. From FY2005 to FY2013, Apple’s earnings per share rose 2,457%. That’s a rise in earnings per share from $1.55 to $39.63. Apple reached its current high watermark for earnings per share in FY2012 at $44.16. The falloff in earnings per share in FY2013 is for our members the source of ongoing discussion and debate as Apple works through a multi-quarter cycle of negative net income growth. Despite very high earnings, as analysts we want constant revenue and earnings growth and data-driven justification for the share price to move higher. In my view, Apple will be valued by the stock market based on the perceived pace of product innovation and the pace of earnings growth. While it might be argued there are better or more accurate ways to determine the company’s value, the share price will rise and fall on the company’s profit growth and perceived potential for profit growth. To the market, little else matters. There are many members of the Braeburn Group that might disagree with my view of how the market values Apple. This is what makes active discussion and debate worthwhile. We learn with every twist and turn of the company’s fortunes and from the different points of view among our members. The graph below illustrates the percentage of revenue contributed by each of Apple’s regional revenue segments in FY2013 that ended in late September. The United States and China are currently the only two countries in the world that contribute 10% or more of Apple’s revenue. Japan may become the third country to enter that exclusive group. 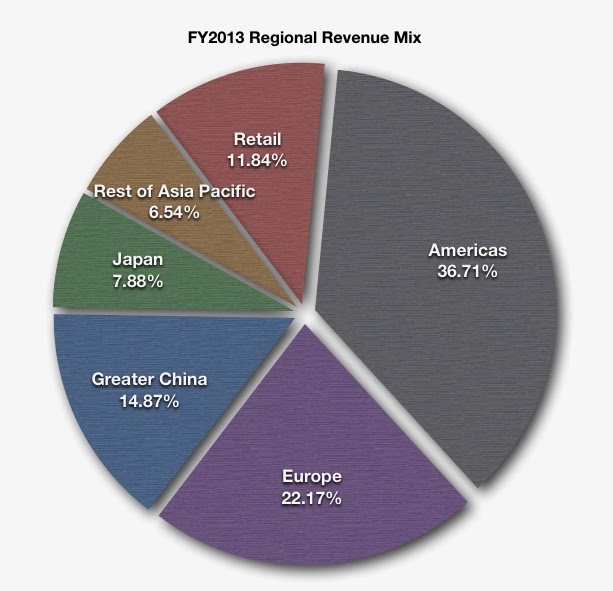 The graph below illustrates the rates of regional revenue growth in each of Apple’s regional revenue segments. Analyzing Apple is less of an effort to determine how many iPhones and iPads the company might sell in a 91-day period. It’s an effort to understand and forecast where in the world Apple is finding the best and most profitable markets for growth. New products or product categories and continued geographic expansion all factor into Apple’s future growth mix. It’s not just counting iPhone and iPad unit sales or the number of new iPhone carriers added. It’s a matter of finding and distilling data related to all elements in Apple’s revenue and earnings matrix. It’s been four years since Apple released a major new product line. The original iPad debuted in April 2010. Apple is an episodic enterprise. It’s a company that since the start of the new millennium has reinvented itself as the maker of digital music players, smartphones and then tablets. While we don’t know with certainty what new product or product category Apple will announce in the coming months, history suggests a new product or product category is all but a certainty at this time. At Apple’s annual meeting held on February 28th, Tim Cook encouraged short-term traders not to invest in the company. In his remarks the CEO again promised new products were coming soon and his vision is for the long-term. I’ll take him at his word. Apple’s next episode of strong revenue and earnings growth will commence within the next several months. But forecasting Apple’s future growth isn’t easy. It’s about new products and a whole lot more. What sells well on Main Street, USA will need to sell well in Beijing, London, Sydney, Tokyo and other major population centers around the world. This is what makes Apple analysis so much fun and an all-encompassing interest. For those that engage in our full-contact, participatory sport called Apple analysis, there’s much to learn and track each and every day. Apple will soon begin a new episode of growth. For those that do choose to remain on the sidelines, grab the popcorn and turn on the Apple TV. The next several months will be fun to watch. During this time, the members of the Braeburn Group will be hard at work putting the different pieces of data together to understand where Apple is headed and forecast future rates of growth while chasing down every available clue. Don't ask us why we do it. It's just our version of a full-contact, participatory sport.